Our household is now on summer break. For the next ten weeks, our family will be in full summertime mode. Needless to say, this momma has been counting down the days until we completed this school year. No matter how old you are, where you live, or how busy you are, something is exciting about the summer. Maybe it’s the idea of spending countless hours out in the sun, enjoying sweet watermelon at another cookout, or a cold popsicle on a hot day. Summer is just a fun time. With a household full of boys and two working parents, we are creative in continuing to build summer memories while keeping our boys learning and active. So I am always looking for helpful ways to make the most out of summer. How about you? 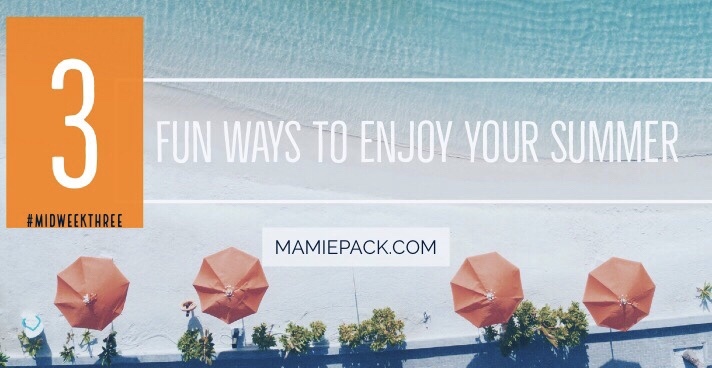 Let’s chat about three fun ways we plan to enjoy our summer and hope they can help you plan a fun summer too! Creating a bucket list is one of our family’s favorite activities. We create bucket lists all the time, whether it’s summertime or Christmas break. Bucket lists allow everyone to have input on what you do as a family. At the beginning of summer, we sit around at our family meeting to discuss what we want to do during the summer. We do create some budget boundaries to help them understand how to be financially savvy and the importance of planning. Other than that, we let our fellas give all sorts of suggestions. This list is great! They love being able to choose which activities we will do for the day and then check it off. Plus, it helps cut down on the dreaded “I’m bored” that is bound to come up multiple times during the summer. (Remember, this is a great activity for couples and families). Many of us have fond memories attending some sort of camp or vacation Bible school during the summer. So why not plan your own? Whether you are a couple or a family of five, you can create your summer camp complete with themes, activities and field trips. Plus, it doesn’t have to take up the entire summer. You can create your own timeline and decide what activities work for you. Art camp: visit local museums exploring various forms of art, plan a painting party, host a gallery dinner where everyone brings a piece of handmade artwork. Sports Camp: learn about an unfamiliar sport, research athletes who significantly impacted the sport, attend a local sporting event, create your team name, mascot, and player. A trip anywhere can add up quickly when you are a large family. One fun way we enjoy the summer is to plan no-spend weekends. Some of our best summer memories are “no-spend” weekends. From running around playing tag or building a fort in the living room, these are some of our favorite memories. We don’t need to continually spend money to enjoy spending time together as a couple or as a family. We can have a great summer simply spending quality time together. Below are 20 ideas to help you get started. Don’t forget to invite a few friends over too! The more, the merrier. What are you doing to enjoy the summer? Have any ideas that I can add to our summer lists? Share below. I would love t hear from you. These are such awesome ideas. I will plan a summer camp for my 4-year-old. That is great. Any ideas for your theme yet? Oh, we love blackberry picking too! Love all of these ideas! Especially the no-spend ideas! Sometimes activities and outings can get very costly. Your list proves how much fun you can have without spending a dime. Absolutely! We don’t have to spend a lot of money to have wonderful memories and have fun. Oh my goodness what a great idea about creating a summer bucket list! These are terrific ideas! I love the idea of a bucket list I haven’t ever thought to do one with the minions. A no spend weekend is right up my alley with 8 kids everything is SO DARN expensive! We have purchased a couple memberships this year so that we could use them for at least a low cost weekend. We still have one more week before we begin our summer break officially! Thanks for sharing your great ideas! Oh, great!! You have to be creative when you have a large family. Membership definitely help. Such awesome ideas! The no-spend weekend would be a great way to be more active outside! It helps to teach our children moderation and be more active. My fellas love it. They feel invested in the process. Let me know how it works out for you. Awesome!!!! Hope you make some great memories during your no spend weekends. I love the summer camp idea! So much fun. The first thing I did when the weather finally broke was to make a bucket list and we are now working our way through it. Unfortunately, we’ve had a lot of rain so far, so we have some catching up to do! Love this! We created a bucket list this summer too. First time in 7 years I have kids that don’t nap. Hoping to make this the best summer yet. 🙂 Thanks for the list ideas. Losing that nap time is a BIG deal!!! Been there!!!! Hope some of these work for you. Yes!!!! It’s so cool to see the world through the eyes of little ones. This is awesome, being someone who has formerly ran a summer camp these are great ideas! I love the summer time as well. Its my favorite!